Meet Dr. Athena Paradise, D.C. Please tell us a bit about yourself and your practice. I have been a chiropractic physician for 27 years now! My dad was a chiropractor, and I remember watching him help people. I decided that was what I wanted to do, too. Having sustained some serious injuries during a car accident almost 20 years ago, I work with a great deal of compassion, gentle adjusting, and lots of exercise and rehabilitation. I love working with nutrition, and giving people the tools to change their world from the inside out! Robyn Hughes, ND, whom I had the great pleasure to work with for a time. They are awesome and help people with everything from low back pain to foot issues. How do you use Correct Toes in your practice? Does using the product affect your overall treatment approach? I recommend Correct Toes to many patients. I am all about getting to the cause, not just treating symptoms (although that is helpful short term!!). Correct Toes help cure the problem. What results have you seen in your patients using the Correct Toes? Which types of patients have benefited the most? Plantar fasciitis, hammertoes, bunion, foot pain, ankle pain, knee pain, low back pain: I have seen great results with all these problems! I work with some dedicated athletes, who are aging and noticing they need more support, something different so that they can keep running or dancing without wearing their body out — Correct Toes have been helpful. 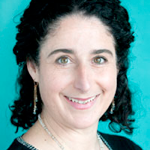 What feedback have you gotten from your patients about the natural foot care approach? I hear from patients that Correct Toes work, reduce their pain and increase their flexibility and ability to move. People love to have tools that work, and that they can use themselves. 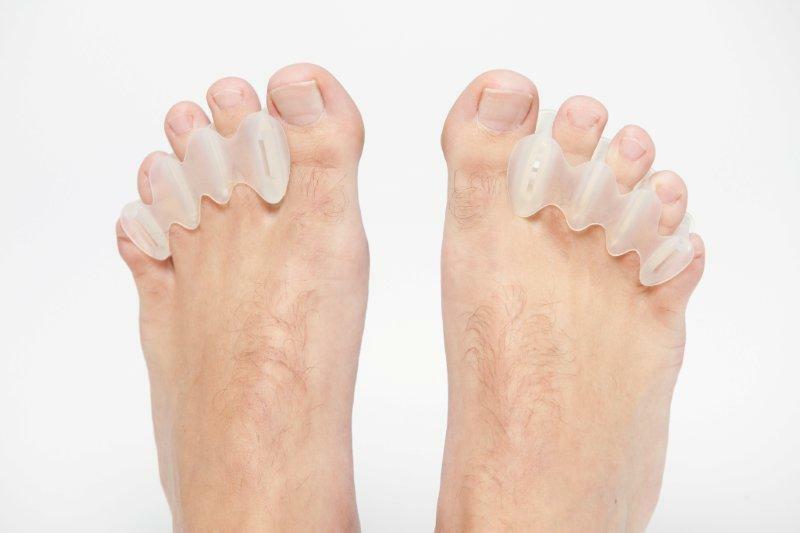 Many healthcare providers (e.g., chiropractors, physical therapists, naturopaths, acupuncturists, and bodyworkers) are using Correct Toes in their practices. Do you see a role for Correct Toes and and its associated natural foot health principles in general spine and joint care? Remember the old song, “the foot bone’s connected to the ankle bone, the ankle bone etc.”? Well, it is true. If we address the foundational elements of a problem, everything gets better from the ground up. That is solid healing. Please feel free to share a patient or personal testimonial, or a patient’s story about recovery from a foot problem. I had broken my big toe as a child, and it never healed well. I finally had surgery when I was 29, and that helped, but I still had pain. Once I started using Correct Toes, my pain disappeared! I could hike, dance, and be on my feet all day without pain. Thank you, Dr. Paradise, for sharing your experience, and for helping keep Portlanders pain-free and active! Dear Dr. Ray McClanahan, I have never met you but I want to thank you. I’m a post-collegiate distance runner who wishes to continue his career as a competitive distance runner. I enjoy running anything from the mile to the half marathon […]. I was constantly broken down in college and running in what many would consider “pronation control” shoes because I was under the impression that I needed support. The past year and a half I’ve made a very good transition into more minimal based shoes, but recently have been running into forefoot/toe pain. Then I discovered your website. I now own a pair of Correct Toes, metatarsal pads, and [minimalist footwear]. I’ve been walking in them and running a little bit. The pain is gradually going away and my feet are feeling healthier and stronger. […] I think it’s safe to say that your ideas on footwear and foot health are very progressive and forward thinking. You must continue doing what you’re doing and get the good word out. Good ideas will always be the best defense against bad ones. And your ideas are clearly good – very good. Click here to read more Correct Toes testimonials! One thing our Correct Toes team loves most is seeing the change that comes from people embracing a new outlook on foot health! We’ve been fortunate to receive email updates from Ricky, a Correct Toes wearer in Japan. Ricky bought his first pair of Correct Toes back in June 2012 and has since seen some great improvements in his feet. He had moderate bunions, flat feet, and burning sensations in his metatarsals from standing for long periods of time at his job. Through an internet search Ricky found our website and ordered his first pair of Correct Toes! This is a picture of Ricky’s feet 3 days after receiving his Correct Toes. Ricky’s feet 6 weeks (top) and 3.5 months (bottom) after wearing Correct Toes. Big difference! 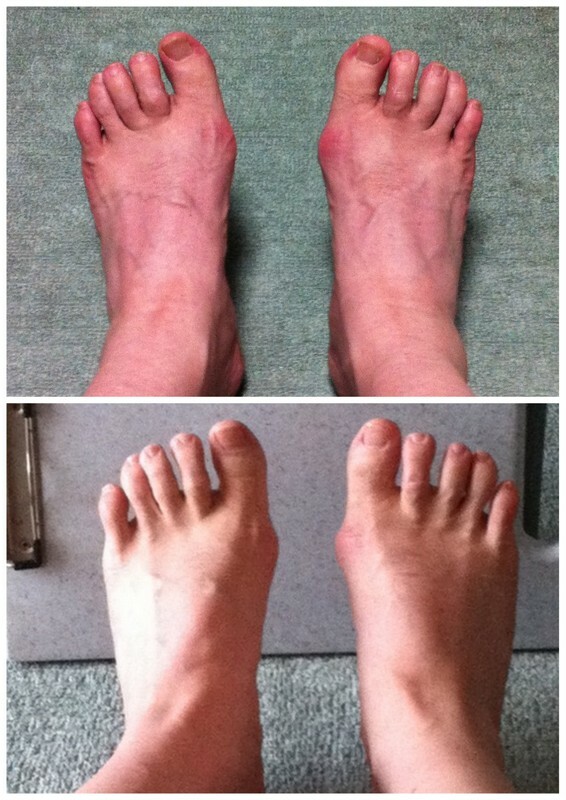 Here are my feet 3 mo after. A lot of that stretchy feeling is gone. It feels nice and loose at the bottom of feet. Almost no stiffness at end of day when I wear minimal shoes. In the Birkenstock, when I feel like I don’t want to walk like a ninja all the time it will stiffen up. I am now back to 3 x a week jump roping 20-25 min a day only in the vivobarefoot shoe. I follow all of the doctors stretch advise from the tube. Our team would like to thank Ricky for graciously letting us share his Correct Toes journey so far! We look forward to seeing continued progress. And, guess what? We want to hear from YOU too! 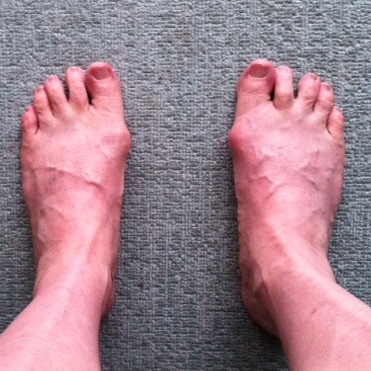 Send us some pictures and tell us your story of how Correct Toes has taken your feet from funky to functional!